[AUTO](VC/RC):When placed, COST [Counter Blast (1) & Soul Blast (1)], choose one of your opponent’s rear-guards in the front row, and retire it. 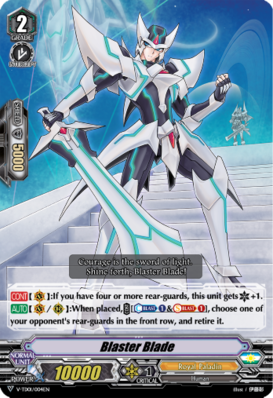 So this is what the new Blaster Blade will look like in 2 weeks. As you can see, we’re power-creeping this format up the wazoo. 10k body as standard with no negative skills is the new normal. Anyway, 4 rear-guards for a free vanguard Critical is easy enough (or at least it should be once we get the first proper booster at least), but Early Game, it’s not something to go out of the way to set up. It’s nice, but not worth throwing Grade 0s on the board to play. The retire ability is of course nothing really new. A bit expensive for this meta perhaps, but not too much of a problem, especially in Premium when Barcgal is free to use. Standard-wise, there’s bugger all else to use as far as RP decks are concerned. Good thing the Trial Deck will come with 4, eh? What’s up, Rogue Squad?! To wrap up Blaster Blade Week, we’re looking at the V Series version of Blaster Blade (which is still named Blaster Blade but needed the V part to differentiate). The fact that this is now a 10k with no drawback means that this is probably going to be the newest norm for Grade 2’s, though I’m going to theorize that any Grade 2’s with less power or no effect will compensate with extra Shields as I’ve seen Gallatin, who’s a 10k Vanilla, have a 10k shield, so I’m expecting these kind of small differences would have to be taken to account in the future. Anyway, back to V Blaster Blade, the +1 Critical is a bit of a risk unless you can get an easy calling engine from others’ skills, like V Akane, so only time will tell for certain other easy Superior Calls. His on place skill has a slightly different cost as it’s now a counterblast & soulblast 1 instead of a counterblast 2, which is nice as it gives you more options for future skills. Overall, I believe that Blasters will be one of the long-standing frontrunners of the V Series for a long time. Next Time: The Top 10 most influential cards for the G Era.